In 1796 Dr George Pinckard [Notes on the West Indies, London, 1806] noted that Mr Porter 'was one of the earliest planters on the sea coast' and had made a very large fortune. By 1798 Porter owned plantations Hoope, Paradise and one other. A futher plantation was owned by Porter & Jardine. 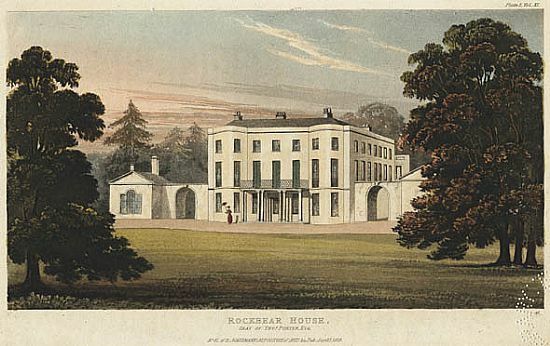 He returned to England and by 1800 had purchased Rockbeare in Devon [Trewman's Exeter Flying Post, October 23, 1800]. In 1804 he became High Sheriff of Devon. Porter's sons, Thomas and Henry, inherited the plantations in Guyana. After emancipation in 1834, Thomas Porter II was paid compensation of £19,285 for 385 slaves on plantation Paradise while Henry received £35,940 for the 709 slaves on plantation Enmore. Thomas Porter III [1813-97] was born in Rockbeare. He was educated at Eton and matriculated at Oriel College, Oxford, in June 1831. He served briefly in the Cavalry before going to Demerara in the 1830s. He spent 25 years running sugar estates there and married Charlotte Wolseley, born Antigua, whose family also had strong connections with Guiana. Thomas, commonly referred to as Tom Porter, was a man of standing in Demerara. He was the Acting Stipendiary Magistrate when 79 of the 83 ex-slave shareholders appeared to sign the Articles of the Agreement for the local government of Victoria Village in 1845. In 1848 he was a local Director of the Demerara Railway Co Ltd: the original section of the railway ran through Enmore. In the 1840s and 50s he was a member of the Court of Policy of British Guiana. In 1855 he was a member when urgent debate took place about the threat from the sea due to lack of proper maintenance of the sea wall.